You’ll have to forgive me for including some non-food related posts on to this little blog, but some of my most recent food making attempts have turned out less than stellar. As I mentioned a few weeks ago, the nursery was under way, but things were still far from done and nothing had been photographed. Well, it’s still not completely finished, but I did manage to snap a few select shots last night. 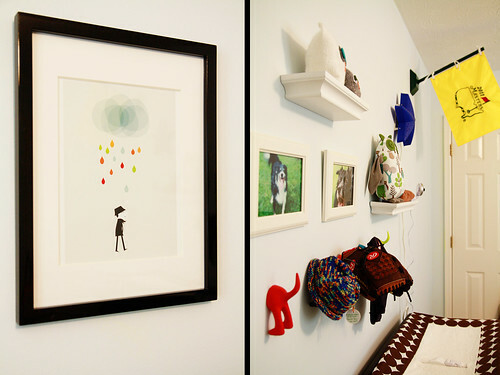 These are more or less just the accessories, but honestly, these are my favorite features of Baby O’s soon to be room. These owls are honestly just about the sweetest things I’ve ever seen. I made the decision to include owls a while back…not really sure how or why owls became a pseudo theme for the room, but they did. And these little fellas make me realize I made the right choice. These little guys were handmade by a very dear friend. The raindrop print I found in another nursery online and I instantly became obsessed. I made a rainy day mobile to complement the print, but it’s not hanging so you’ll have to trust me when I say it’s cute. And did I mention, handmade? By me? I know. Nuts, right? And lastly, the family photos. I wanted our little guy to be surrounded by the people who will love him most in the world…and yes, that includes our dogs, or rather, the puppy versions of Libby and Justice. The photos took up a ton of wall space, but I couldn’t be happier with the finished product. Now, just a few more weeks until Baby O will officially be here – hopefully loving this room as much as we do. Love the puppy dog tail sticking out of the wall! And I love that little hat that’s hanging on it too. 🙂 Nice to know Baby O’s brother and sister of the furworld made it onto the family wall. Adorable… now I just want to see this little guy! 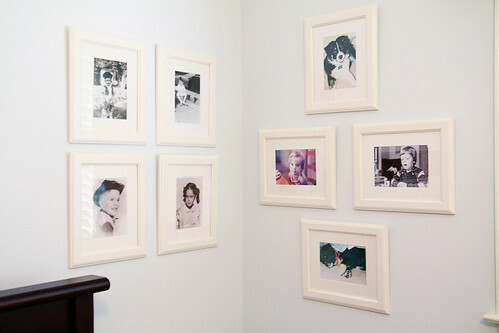 Did I mention how much I love the idea of baby pictures of the family? Pretty sure I did. Awesome decorating, Mama! SO EXCITED FOR YOU! Too freaking adorable. Rest up over the next few weeks and enjoy some peace and quiet. Baby O? Have you told us the name yet? Did I miss that? or is it a secret? Fantastic room! love the family photos. Wow, you’re nursery is so cute. I love that rainy day pic. Can’t wait to see your mobile! You are going to love being a mother! Motherhood transformed me in ways I could not imagine. Love the owls. yay! 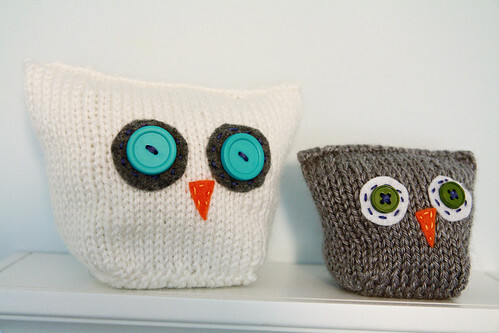 I love owls and I LOVED these when I first saw them done! I love it when a nursery looks like a cutesy room that belongs in the whole house. LOVELY! Let me poke that belly! It’s beautiful! I love those little owls. And the Raindrops print. And the family photos. And that you included your dogs! Soo cute! Those owls are fantastic! you know the only think that could make that room better? A sailor suit hanging in the corner. bam.